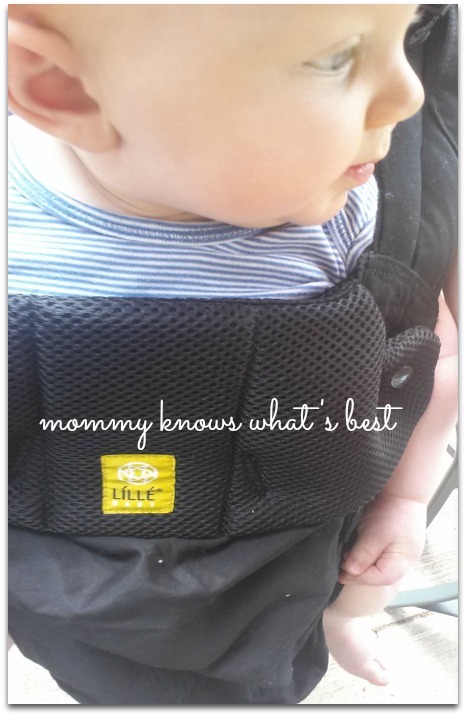 Note: I was sent the LÍLLÉbaby Complete All Seasons 6-in-1 Baby Carrier to review. All words and opinions are mine. This post contains affiliate links. $10 off referral link below! 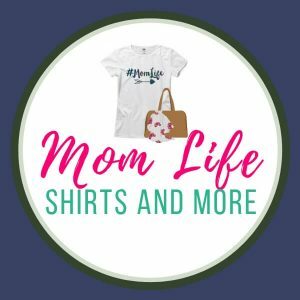 When my third baby was born, I discovered how truly wonderful babywearing can be. I mean, I tried it with my oldest two babies, but I just couldn’t get the hang of it. Turns out, it was the carrier I had, not babywearing itself. 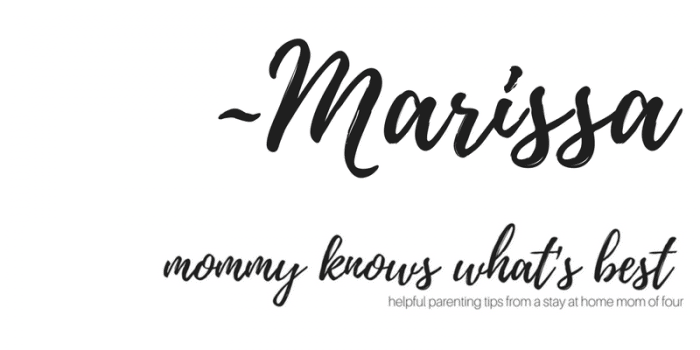 I carried my third baby in a wrap, but after about two years, I wasn’t able to wrap him well enough and sought out a soft structured carrier (SSC). I found one that I really like, but it’s just a tad warm to be using in the summertime. I was thrilled when I was given the chance to review the LILLEbaby COMPLETE All Seasons 6-in-1 Baby Carrier! Since it’s all seasons, it’s designed to help keep you and your baby or toddler cool in the summer and warm in the winter. It’s great for year round adventures! The LÍLLÉbaby COMPLETE All Seasons baby carrier combines more carrying positions, lasts longer, and includes more features than any other baby carrier. The Original line features sturdy canvas cotton. The Airflow line features 3D breathable moisture-wicking mesh for maximum airflow and ventilation to help both baby and parent stay cool. The All Seasons line features an adjustable center panel: zip up for warmth and zip down to reveal cool, breathable, 3D mesh. 3. TWO-WAY STRAP NEW! – Enable wearer to carry “backpack style” or with straps crossed in the back. Dual adjustment buckles simplify breastfeeding and adjusting straps on the go. 4. SLEEPING HOOD– Features dual adjustment points to provide tailored support for baby’s head while sleeping, sun protection while exploring, and privacy while nursing. Removable. 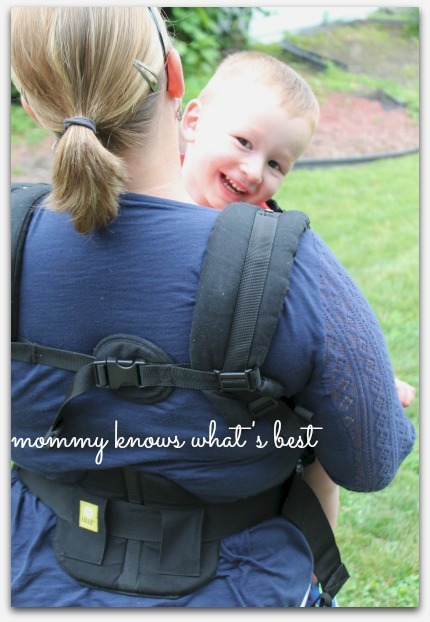 It took me a few times using the LÍLLÉbaby COMPLETE All Seasons 6-in-1 baby Carrier to get used to the buckles and straps to adjust since it was a tad different than my other SSC, but I fell in love with it. 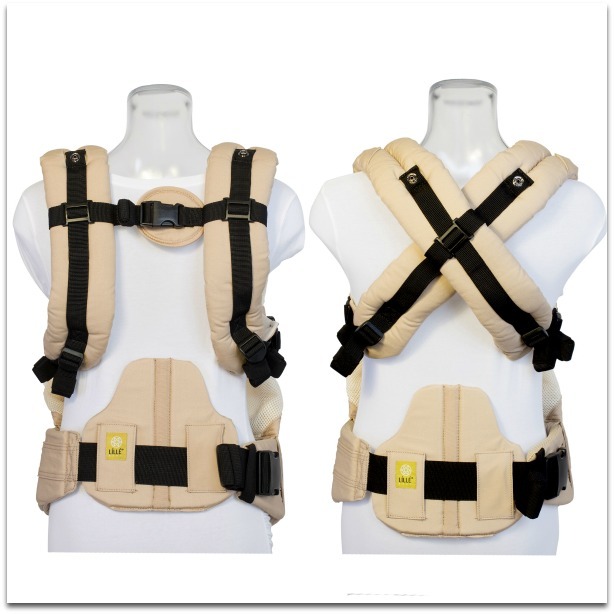 The straps are very comfortable, and the lumbar support is awesome for front carries. I really like the wide belt as well which doesn’t dig in when babywearing. I also like that you can wear the straps backpack style or crossed. I use it for both my toddler and my baby nephew. My toddler really likes going on what we call piggy-back rides in the carrier. I like that it fully supports his wiggly toddler body and that at nearly three months pregnant, I have no issues carrying him and I don’t feel any pain in my back or shoulders. He also loves to cuddle in a front carry. I like that as a big toddler I can still carry him like that! My nephew is only about 6 months old here, so I was able to carry him in a front carry, both facing in and out. He liked to take naps while facing in, and while facing out he saw the other kiddos playing! I like that I was able to adjust the seat for him to make it a more narrow seat, especially while facing out. Since he’s still young, he seems to prefer a narrow seat. I LOVE the adjustable front panel. What a great idea!! It improves the airflow for baby so baby doesn’t get so sweaty during the warmer summer months. My four year old wanted to try it out so I said why not! She’s about 48 lbs, so a few pounds more than the recommended weight, but I was able to easily get her in and carry her around! I wouldn’t hesitate to carry her on trips when she gets too tired to walk. Much easier than carrying her otherwise! I can’t wait to use it for the new baby (see the one I got her below!)! I won’t need an infant insert for it, which is awesome, and I’ll get at least four or more years of use out of it! 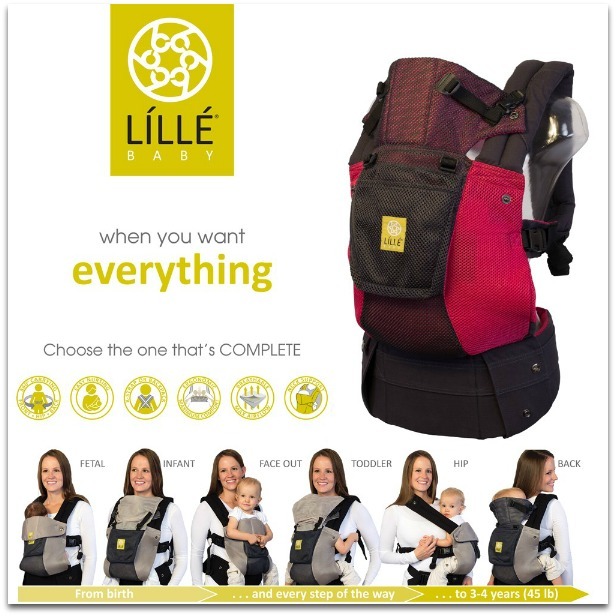 I would definitely recommend the Lillebaby All Seasons Complete Baby Carrier. 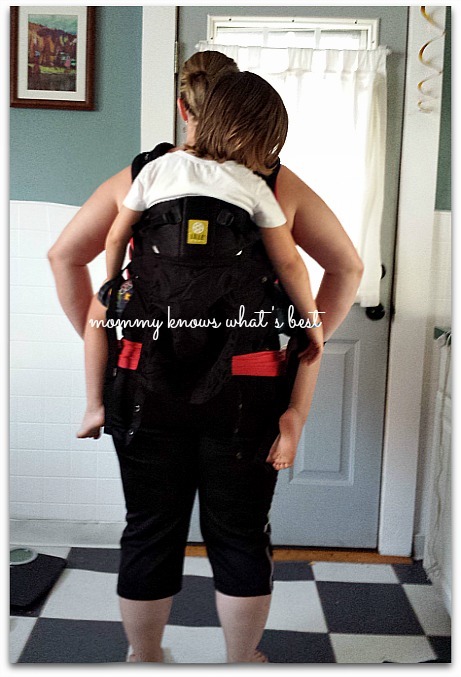 Many thanks to LILLEbaby for sending me this carrier to review! I Love My Lillebaby All Seasons Carrier So Much, I Bought a Second One! I bought the Lillebaby All Seasons Complete in Seahorses when I had my baby girl. Now I have one for the car and one for home! I use them everywhere! You can find the LÍLLÉbaby COMPLETE All Seasons 6-in-1 baby Carrier on LILLEbaby’s website here and also on Amazon here (Prime users get FREE two-day shipping!!). You can also see all of the other LILLEbaby Carriers and compare them here. There are also some great instructional videos on the site you should really check out! They are super helpful! Follow LÍLLÉbaby on all their social media channels, where you’ll find updated product information (some great new carriers coming out!) PLUS giveaways quite often! I love those pictures. Looks like the kids are having fun with mommy. They have so many nice things like that then when I was raising my children, many years ago. Even better then when my grandchildren were small. 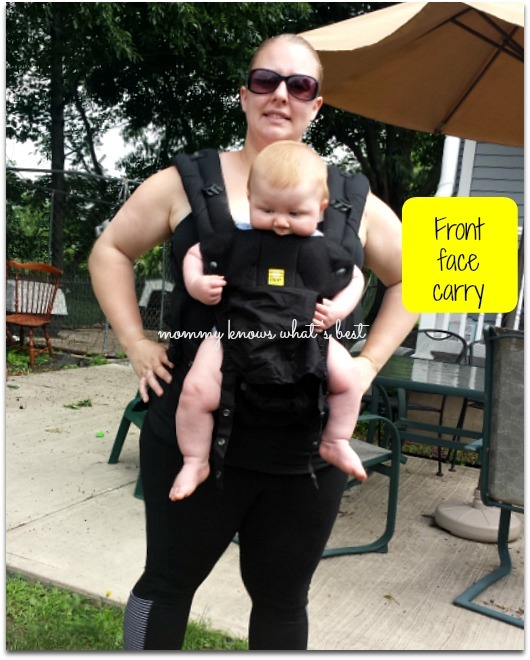 If I had a baby or a child small enough, I would definitely get a Littlybaby carrier. I have never tried a nice baby carrier before, but this one looks like a great one to check out! Looks great! I keep hearing really great things about this carrier! Oh I have heard nothing but AMAZING reviews about the Lillebaby and after reading this one I am totally sold!! I love the climate control and multiple positions!!! So great!! Their new embossed line is GORGEOUS!!! This looks like a nice and sturdy baby carrier. It seems to be real safe for the baby too. 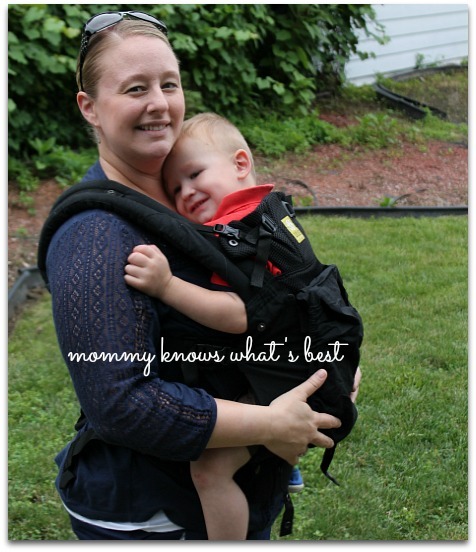 I really love this LILLEbaby carrier. This is one of the best ones I have seen, very nice features. Love the different ways to wear this and the awesome support. Very comfy for mom and baby. I love the pictures! It shows how many different ways you can “wear” your baby! 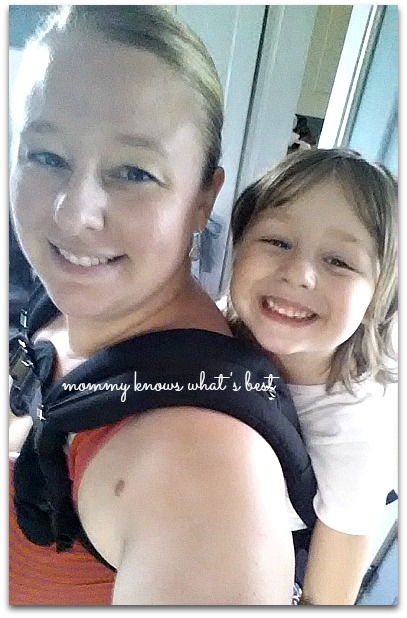 I was “baby wearing” before it was cool (my girl is 15), so I love seeing moms these days wearing their babies! I wish this had been around when my kids were little! 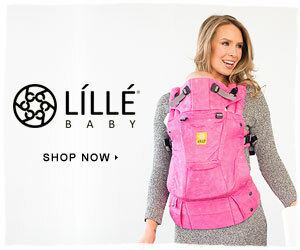 I have a different brand carrier, but I’ve always wanted to try a lillebaby. Thanks for the post! 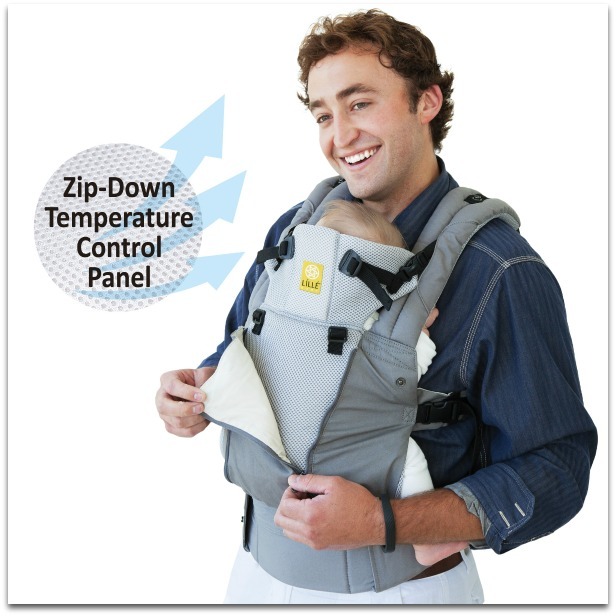 What a very fancy baby carrier, and I like that when it is warm that I can zip down and get air ventilation for child. This is a good one to get my sister for her baby shower! oh my gosh, what an amazing baby carrier! I wish this was available when my teen was a baby! Wow! This is a pretty amazing carrier! I love all the features, but especially the 6 ergonomic carrying positions. This sure would make a great shower gift for soon-to-be parents! Thank you for this review. I struggle with having bad posture, so this is awesome. This looks comfortable and better than my current ssc for summer weather! I am going to tell my granddaughter about this one. It’s her first baby and this is so cute. What a great carrier. I really like that it can be worn in the front or back. This carrier looks so comfortable! I’d love to have one for my huge toddler! That’s such a versatile carrier. 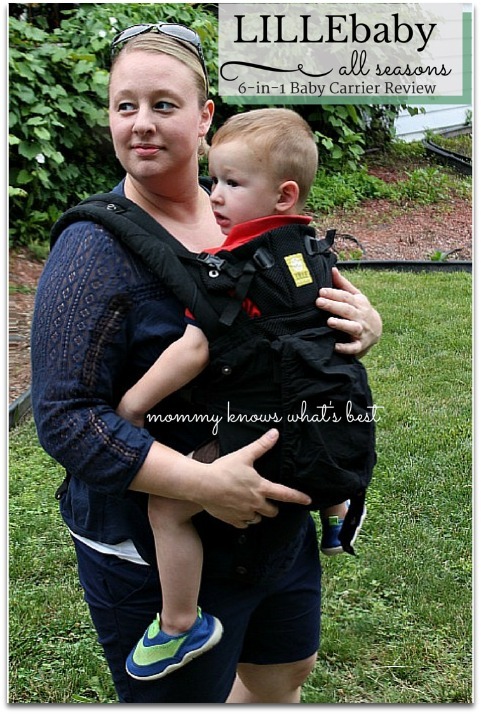 I love these baby carrier reviews since there are so many nowadays on the market to choose from. And your post is even more detailed with photos. Thanks for sharing. These look so nice and comfortable–definitely on my wish list!